Japan is now famed for its beautiful sakura (cherry blossoms) but back in the Edo period, it was ume, or plum blossoms, were the quintessential sign of spring to come. Ume blossoms are not quite as flashy and bountiful as sakura blossoms, but certainly very pretty in a subtler, more elegant way. They were also prized for its sweet scent. Plum blossoms arrive in Japan near the end of winter, earlier than most other blossoms. This means around mid-February to early March for Tokyo. Temples and shrines also hold ume matsuri, or plum blossom festivals, around this time to celebrate the beauty of these flowers and the welcome arrival of warm weather after months of chilly winter. One example of a renowned ume matsuri spot in Tokyo is the Setagaya Ume Matsuri, in a small pubic park called the Hanegi Park, which boosts hundreds of various species of plum trees. 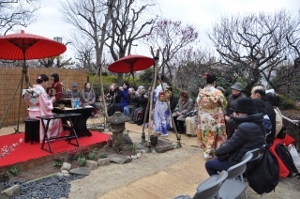 On weekends in February, people take short strolls around the park to admire the plum blossoms, while citizen volunteers set up stalls selling all sorts of plum season related things, from plum flavored udon to potted plum bonsai trees. Volunteers also put up traditional performances like haiku readings and dances to entertain the crowds. Plums are still widely used in Japanese food culture. They come in the form of umeshu (plum wine) a sweet alcohol popular especially amongst women. Also common is umeboshi (pickled plum), a favorite topping for many a bowl of rice. Its bright pink color, vicious texture and intense sour-sweetness makes it an acquired taste. Besides food, plums are common cultural symbols in season-loving Japan. Plum blossoms adorned many beautiful kimonos and lacquer art, all signifying the coming of spring and hope and renewal for generations of Japanese. Japanese family crests also sometimes feature plum blossom symbols.